Also known as Coconut Sugar, Coco Azucar is a natural sweetner derived from the sap of the coconut palm. According to the Phillipine Department of Agriculture, coco azucar contains several nutrients, making it an alternative to traditional cane sugar or high fructose corn syrup. In addition to retaining nutrients from the palm, coco azucar also may have a lower glycemic index than traditional sugar, which is a major plus in our books! With fewer calories and higher mineral content than honey, maple syrup may be your new go-to sweetener. Rich in manganese and zinc, this sweetener packs a little more than just its sweetness. Manganese is an essential enzyme cofactor in cell energy production and detoxification. While zinc is essential for healthy endothelial cells and a healthy prostate. But that’s not all, maple syrup is also loaded with antioxidant polyphenols providing anti-cancer, anti-inflammatory, and immune boosting properties. Who knew your waffle’s sidekick could have so much potential? Maple syrup has been known to cause less gas and discomfort than most other sweeteners (both natural and artificial). Sweeten up your life with some coconut sugar. Why? #1. Comparatively, coconut sugar has a lower glycemic index than regular sugar, most likely from the fiber inulin, which helps lower glucose absorption. Moreover, inulin also boosts mineral absorption and supports good gut bacteria (inulin = prebiotic). #2. Coconut sugar is a dry ingredient, making it a great substitute in baking recipes that call for white or brown sugar - meaning you don’t have to convert anything in the recipe, unlike using a liquid sweetener like maple or agave. #3. It’s a beautiful dark tan color that looks scrumptious as a crumble topping. #4. Although very little, coconut sugar also has some traces of minerals - iron, zinc, potassium, calcium, magnesium, and a few other antioxidants. However, coconut sugar is still sugar, and we suggest you don’t over do it. Coconut sugar has a neutral pH, thus it doesn’t add acidity to our recipes. 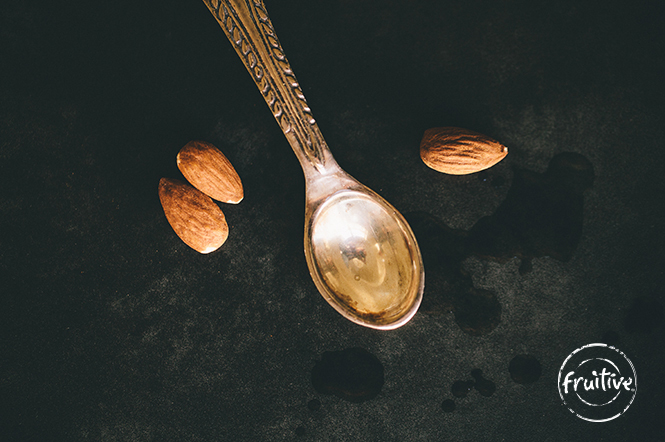 Almond extract is made from a combination of bitter almond (which is actually inedible because it contains the toxic molecule, hydrogen cyanide; however it's left out of the oil after the extraction process), water, and ethyl alcohol. Apples don’t only taste good, but also provide so many nutritional benefits that it’s hard not to believe the old wives’ tale, “an apple a day, keeps the doctor away.” Since most of the nutrients in apples have antioxidant properties (vitamin C, quercetin, flavonoids & polyphenols), it’s not surprising that apples are believed to help reduce the risk of cancer, have anti-inflammatory and cardiovascular benefits, reduce the risk of chronic disease, regulate blood sugar, and boost the immune system. Specifically, applesauce, made with peeled apples, packs all the same nutrients and health benefits of an apple, but with a little less fiber and vitamin C. Besides its nutritional benefits, applesauce is extremely versatile – it can be used to replace eggs, butter, &/or sweetener in baked goods – we use it as a sweetener for our granola! OUR SOURCE: We get our applesauce from Eden Foods, it’s made with only organic, peeled & cored apples - no added sugars or fillers! Delish! Applesauce has been known to help relieve constipation and diarrhea. It's also one of the best things to add to your pantry if you're an avid baker - it's super versatile.